Paphiopedilum rungsuriyanum from Northern Laos was discovered and described in 2014. It is characterized by having miniature tessellated leaves, a flower having a helmet shaped lip with a V-shaped neckline, and a semi-lunate, 3-dentate staminode with an umbo. These morphological features distinguish P. rungsuriyanum from the other known sections/subgenera of Paphiopedilum, making it difficult to group with existing infrageneric units. Paphiopedilum rungsuriyanum has chromosome number of 2n = 26. 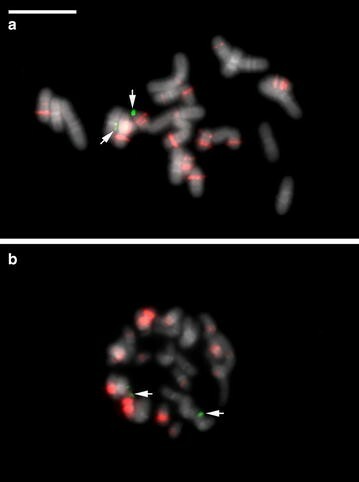 Fluorescence in situ hybridization study demonstrates that there are two 45S rDNA signals in the telomeric region of chromosomes, and more than 20 5S rDNA signals dispersed signals in the pericentromeric and centromeric regions. Phylogenetic analyses based on four nuclear (i.e. ITS, ACO, DEF4 and RAD51) and four plastid (i.e. atpI-atpH, matK, trnS-trnfM and ycf1) gene regions indicate that P. rungsuriyanum is nested in subgenus Paphiopedilum and is a sister to section Paphiopedilum. The results in combination with karyomorphological, rDNA FISH patterns, morphological and phylogenetic analyses suggest a new section Laosianum to accommodate this species in the current sectional circumscription of subgenus Paphiopedilum. The genus Paphiopedilum comprises about 80 species, extending from the Himalayas and southern China through Malaysia to Guadalcanal (Braem 1988; Cribb 1998). The beautiful flowers of Paphiopedilum species are shaped like the slipper of Aphrodite and hold a place in the affections of orchid hobbyists in the world. In the wild, Paphiopedilum populations are found in relatively restricted areas, and most Paphiopedilum species are endangered or even facing extinction because of the over-collection and the destruction of their habitats. Paphiopedilum can be classified into three subgenera including subgenus Parvisepalum, subgenus Brachypetalum and subgenus Paphiopedilum based on morphological, cytological and molecular phylogenetic data (Cribb 1998; Chochai et al. 2012). In addition, the subgenus Paphiopedilum could be divided into five sections: Paphiopedilum, Barbata, Cochlopetalum, Coryopedilum and Pardalopetalum. The limestone mountains of Indochina are home to a great diversity of endangered Paphiopedilum species. During the past two decades, a number of amazing Paphiopedilum species with very limited distribution were discovered in this area, such as P. vietnamense and P. hangianum (Averyanov et al. 2003; Liu et al. 2009). For now, the central region of the Indochina, particularly the territory of Laos, contains the largest part of the Indochinese limestone mountain which remains to be investigated. These inaccessible areas, undoubtedly, are home for numerous unknown plant species, particularly for strictly endemic orchids. A few years ago, P. canhii was discovered and described from the limestone mountain in north-western Vietnam near the Laotian border (Averyanov 2010; Averyanov et al. 2010). The distinct flower morphology led some taxonomists to propose a new section Pygmaea under subgenus Paphiopedilum (Averyanov et al. 2011), or even a new subgenus Megastaminodium (Braem and Gruss 2011) to accommodate this species. Afterward, based on the cytological data, phylogenetic analyses using plastid and nuclear genes and morphological characters, Gorniak et al. (2014) suggested the status of the separate subgenus Megastaminodium within the genus Paphiopedilum as proposed by Braem and Gruss (2011). In 2014, P. rungsuriyanum was identified as a new species from smuggled plants under the name of P. canhii from Laos (Gruss et al. 2014). Later, more plants were found on the rocky limestone in Northern Laos. Although the tiny plants with marbled leaves look similar to P. canhii, the other morphological characteristics of flower, such as staminodial shield, lip, and petal/sepal ratio and color are distinct from P. canhii and species in the other sections/subgenera. Therefore, more detail studies are required when we are going to propose the taxonomic status to accommodate P. rungsuriyanum. Paphiopedilum has been characterized by the significant chromosome variation, ranging from 2n = 26 to 42 (Duncan and Macleod 1949; Karasawa 1979; Karasawa and Aoyama 1988). The changes of chromosome number and karyotype are suggested to be caused by Robertsonian translocation, e.g. the fission of metacentric chromosomes at the centromeric region to generate more telocentric chromosomes (Karasawa and Saito 1982; Jones 1998). In addition, results from FISH mapping of ribosomal rRNA genes indicates that the duplication of 25S rDNA loci occurred independently in subgenus Parvisepalum and the sections Coryopedilum and Pardalopetalum of subgenus Paphiopedilum, while the duplication of 5S rDNA loci can be detected only in subgenus Paphiopedilum (Lee and Chung 2008; Lan and Albert 2011). Together, these data (in combination of chromosome number, karyotype and rDNA site) provide valuable information for cytotaxonomy in the subgenus/section level of Paphiopedilum. This study aims to provide cytological, molecular and morphological data which could cast new light on the discussion on the taxonomic position of P. rungsuriyanum within the genus. The materials of P. rungsuriyanum and P. canhii were obtained from the orchid collection of Sulivong Luang Aphay in Lao PDR. The samples are accompanied by CITES permits. Voucher and GenBank accession numbers are listed in Additional file 1: Table S1. Root tips of Paphiopedilum species were harvested and pretreated in 2 mM 8-hydroxyquinoline at 20 °C for 5 h. After being rinsed with distilled water, the root tips were then fixed in fresh prepared Farmer’s fluid (three parts of ethanol to one part of glacial acetic acid). Root tips were macerated with 6% cellulose (Onozuka R-10, Yakult Honsha, Tokyo, Japan) and 6% pectinase (Sigma Chemical Co.) in 75 mM KCl, pH 4.0 at 37 °C for 90 min, and stained in 2% aceto-orcein, and then squashed on slide according to the methods of Karasawa and Aoyama (1988). 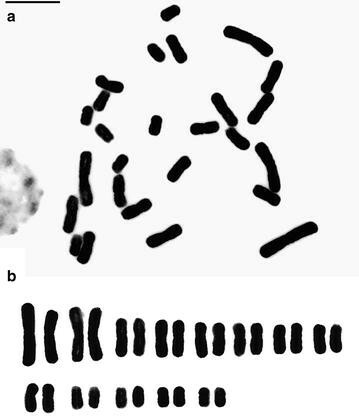 The images of well-spread chromosome complements were captured by a CCD camera attached to a light microscope (Axioskop 2, Carl Zeiss AG, Germany). For the subsequent FISH experiments, the cover glasses were removed with a razor blade after freezing the slide in liquid nitrogen. Slides were dried and stored at −80 °C until required. The FISH procedure was essentially the same as previously described protocols (Lee et al. 2011). The rDNA probes used in this study were 45S rDNA (pTA71) from Triticum aestivum (Gerlach and Bedbrook 1979) and 5S rDNA (pTA794) from T. aestivum (Gerlach and Dyer 1980). All probes were labeled by nick translation with digoxigenin-11-dUTP or biotin-16-dUTP (Roche Apply Science, Basel, Switzerland). The digoxigenin-labeled probes were detected by anti digoxigenin–rhodamine (Roche Apply Science). The biotin-labeled probes were detected by anti-biotin-fluorescein isothiocyanate (FITC) (Vector Laboratories, Burlingame, CA, USA). Chromosomes were counterstained with 4′,6-diamidino-2-phenylindole (DAPI) in an antifade solution (Vector Laboratories, CA, USA). Images were taken by a CCD camera attached to an epifluorescence microscope (Axioskop 2, Carl Zeiss AG, Germany). Total DNA was extracted from silica-gel dried leaf by using DNeasy Plant Mini Kit (Qiagen, Hilden, Germany) according to the manufacturer’s protocols. The nuclear ribosomal spacer regions, ITS1 and ITS2, and the 5.8S ribosomal gene (ITS) (Douzery et al. 1999), three low-copy nuclear genes (ACO, DEF4 and RAD51) and four plastid regions (atpI-atpH, matK, trnS-trnfM and ycf1) were amplified with the same primers as in Guo et al. (2015) and listed in Additional file 2: Table S2. PCR amplification and the Sanger sequencing were carried out as described by Guo et al. (2015). PCR products that were difficult to sequence directly were cloned using the pGEM-T Vector System II (Promega, Madison, WI, USA). The sequencing reactions were performed by the DNA analysis core laboratory (Institute of Plant and Microbial Biology, Taipei, Taiwan). Sequences were identified (Additional file 1: Table S1) using a BLAST search against the NCBI sequence database (National Center for Biotechnology Information, GenBank) to find the closest sequence matches in the database. For phylogenetic analysis, four low-copy nuclear genes (ACO, DEF4, ITS and RAD51), four plastid regions (atpI-atpH, matK, trnS-trnfM and ycf1) and the combined all data were added to the analysis by referring the data matrices created by Guo et al. (2015), and sequences of Mexipedium xerophyticum and Phragmipedium longifolium were used as outgroup taxa. DNA sequences were aligned using CLUSTALX (Thompson et al. 1997), followed by manual adjustment. The alignment matrices were analyzed by the maximum parsimony (MP) using PAUP* version 4.0b10 (Swofford 2003) with tree-bisection-reconnection (TBR) branch swapping and the MULTREES (holding multiple trees) option in effect with 1000 replicates of random sequence addition. Tree length, consistency index (CI) and retention index (RI), and ts/tv ratio were calculated. Support for groups was evaluated using the bootstrap method (Felsenstein 1985) with 1000 replicates. For checking the incongruence between plastid and nuclear data, the incongruence length difference (ILD) test (Farris et al. 1994) was performed in PAUP* version 4.0b10, and 1000 replicates with the same settings as in the heuristic searches were conducted. Phylogenetic relationships were further analyzed by a model-based Bayesian approach using MrBayes 3.2.1 (Ronquist and Huelsenbeck 2003). The best-fitting model of evolution (Additional file 3: Table S3) was selected under Akaike information criterion test (Akaike 1974) as implemented in MrModeltest 2.2 (Nylander 2004). Two separate runs of four Monte Carlo Markov chains (MCMC) (Yang and Rannala 1997) were run for 3,000,000 generations until the mean deviation of split frequency dropped below 0.01, and a tree was sampled every 1000th generation. Trees from the first 25% of generations were discarded using the “burn-in” command, and the remaining trees were used to calculate a 50% majority-rule consensus topology and to determine PP for individual branches. The trees obtained in these analyses were drawn with the TreeGraph 2 software (Stover and Muller 2010). The floral structure, including column (staminode and stigma), lip, sepals and petals provides valuable taxonomic traits in Paphiopedilum classification (Atwood 1984; Braem 1988; Cribb 1998). The miniature plant of P. rungsuriyanum with its marbled leaves looks similar to P. canhii, nevertheless their flowers differ significantly from each other in terms of flower colors, petal and lip shapes, and the shape of staminode (Fig. 1; see the plates in Gorniak et al. 2014). The staminode of P. rungsuriyanum is distinct from P. canhii, being half-moon shaped with three lobes and a clear bulge in the middle (Fig. 1c), while the staminode of P. canhii has an ovate-elliptic shape that is entire and unlobed. The stigmatic surface of P. rungsuriyanum is smooth and its pollinium is viscid (Fig. 1d), which are the same as P. canhii and most Paphiopedilum species (except for species of subgenus Parvisepalum, having mammillate stigmatic surface and granular pollinia). The lip of P. rungsuriyanum is different from that of P. canhii, being helmet shaped with incurved lateral lobes (Fig. 1a, b, e). There are several red–purple spots on lateral lobes. The outer surface of lip of P. rungsuriyanum is smooth, while the inner surface has a few trichomes (Fig. 1f). As compared with P. canhii, the trichomes of P. rungsuriyanum lip are shorter and less dense. The petal of P. rungsuriyanum is characterized by its oval shape and intensively red–purple veins (Fig. 1a). The margin of petal has whitish translucent trichomes. The margins and abaxial side of the dorsal sepal and the synsepal are densely pubescent. Besides, the pedicel, ovary and peduncle are also pubescent, covered by trichomes (Fig. 1b). P. rungsuriyanum has marbled leaves with a regular pattern of brighter blotches (Fig. 2). The chromosome number of 2n = 26 is counted here for the first time for P. rungsuriyanum. The chromosome complement is constituted from four large chromosomes varying in length from 12.1 to 10.0 μm, and 22 small chromosomes varying from 7.2 to 3.8 μm, showing a distinct bimodal karyotype. All chromosomes are median type with arm ratios ranging from 1.0 to 1.4 (Fig. 3). The rDNA-FISH results show two chromosomes of P. rungsuriyanum with 45S rDNA signals in the telomeric region. Two 5S rDNA sites were present on the chromosomes bearing 45S rDNA sites, and 20 more dispersed signals in the pericentromeric and centromeric regions (Table 1; Fig. 4a). In P. canhii, there are two 45S rDNA signals in the telomeric region, and at least eight major 5S rDNA signals and about 12 dispersed repeats in pericentromeric and centromeric regions (Table 1; Fig. 4b). The analyses of nuclear genes (i.e. ITS, ACO, DEF4 and RAD51 data matrixes), plastid data matrix and combined data matrix were demonstrated by one of the most parsimonious trees (see Fig. 5; Additional file 4: Figure S1, Additional file 5: Figure S2, Additional file 6: Figure S3, Additional file 7: Figure S4, Additional file 8: Figure S5). Statistics of taxa number, including positions in matrix, variable site, parsimony-informative sites, tree length, consistency index (CI) and retention index (RI) for one of the most parsimonious trees from each analysis is shown in Table 2. Tree topology, bootstrap percentages, branches that collapse in the strict consensus tree obtained from maximum parsimony analysis and Bayesian posterior probability values are indicated in Fig. 5. In the analysis of combined data matrix, the Paphiopedilum species form a strongly supported monophyletic group (100 BS, 1.00 PP), and the division of the genus Paphiopedilum into three subgenera, i.e. subgenera Parvisepalum, Brachypetalum and Paphiopedilum is well supported (100 BP, 1.00 PP for all). The position of P. rungsuriyanum on the multicopy nuclear ITS, nuclear low copy genes, i.e. ACO, DEF4, RAD51, and plastid data remain in conflict. According to the ITS data, P. rungsuriyanum is sister to species of the section Paphiopedilum (Additional file 4: Figure S1). However, on the ACO-based tree, P. rungsuriyanum is sister to the subgenus Paphiopedilum (Additional file 5: Figure S2); on the DEF4-based tree, P. rungsuriyanum is embedded in the section Paphiopedilum (Additional file 6: Figure S3); on the RAD51-based tree, P. rungsuriyanum is sister to the clade comprising species of sections Paphiopedilum, Barbata, Coryopedilum and Pardalopetalum (Additional file 7: Figure S4). According to the combined plastid matrix, P. rungsuriyanum is embedded in the clade comprising sections Barbata and Paphiopedilum (Additional file 8: Figure S5). The analysis of combined data matrix indicates that P. rungsuriyanum is sister species of the section Paphiopedilum, and is deeply embedded in the subgenus Paphiopedilum (Fig. 5). To assess taxonomic position of P. rungsuriyanum within the genus Paphiopedilum, we compared the cytological, molecular and morphological data obtained from the representative species of each subgenus in Paphiopedilum according to the report by Gorniak et al. (2014). Furthermore, we investigated the distribution patterns of rDNA signals in P. rungsuriyanum and P. canhii for cytotaxonomic reference. The major significant characters among the subgroups are summarized in Table 2. Previous cytological studies on Paphiopedilum species have provided valuable data for cytotaxonomy (Karasawa and Saito 1982). In Paphiopedilum, the diploid chromosome number ranges from 2n = 26 (all metacentric chromosomes) to 2n = 42 [with the conserved arm number (n.f.) = 52]. Species of subgenera Parvisepalum and Brachypetalum, and the three sections of the subgenus Paphiopedilum, i.e. Paphiopedilum (except P. druryi and P. spicerianum with 2n = 30) Coryopedilum and Pardalopetalum possess 2n = 26, while two other sections of the subgenus Paphiopedilum, i.e. Barbata and Cochlopetalum, have the chromosome complement of 2n = 28–42 (n.f. = 52–54) and 2n = 30–37 (n.f. = 50), respectively. In section Cochlopetalum, their common ancestor might lose either two telocentric chromosomes or a single metacentric chromosome before divergence of extant species (Cox et al. 1998). Phylogenetic analyses have indicated that plesiomorphic karyotype for Paphiopedilum possessed 26 metacentric chromosomes with increases in chromosome number accomplished by centric fission (Cox et al. 1997, 1998). In our karyotype analysis, P. rungsuriyanum has the chromosome complement of 2n = 26 (Fig. 3), belonging to the groups with plesiomorphic karyotype. Therefore, we may exclude P. rungsuriyanum as a member of sections Barbata and Cochlopetalum. In Paphiopedilum, the numbers and distribution patterns of rDNA loci exhibit a considerable diversity that correlates well with phylogenetic lineages and provide important markers for cytotaxonomy (Lan and Albert 2011). The most parsimonious ancestral number of 25S rDNA sites in Paphiopedilum is two, and duplication of 25S rDNA loci could be detected in subgenus Parvisepalum and in sections Coryopedilum and Pardalopetalum of subgenus Paphiopedilum. Massive duplication event of 5S rDNA loci occurred in all five sections of subgenus Paphiopedilum, while the early diverging subgenera, i.e. Parvisepalum and Brachypetalum retained two 5S rDNA sites (Table 2). In this study, both P. rungsuriyanum and P. canhii possess only two 45S rDNA sites and significant duplication of 5S rDNA sites (Fig. 4a, b). In P. rungsuriyanum but not P. canhii, one of the major 5S rDNA signals are closely linked with the 45S array that is similar to the pattern of rDNA signals in section Paphiopedilum. From the rDNA FISH data, we may exclude P. rungsuriyanum as a member of subgenera Parvisepalum and Brachypetalum and suggest a closer relationship to subgenus Paphiopedilum. Paphiopedilum rungsuriyanum and P. canhii are found in the limestone areas in Laos. Although both of them have the miniature plants with tessellated leaves and the chromosome number of 26, their flowers are clearly different and distinct from species in the other subgenera/sections (see Additional file 9: Table S4). A new subgenus Megastaminodium (Braem and Gruss 2011) or a new section Pygmaea (Averyanov et al. 2011) has been proposed to accommodate P. canhii, but it now looks difficult to place P. rungsuriyanum and P. canhii into the same group. The phylogenetic analyses using multiple genes would be helpful in the treatment of systematic position at subgenus/section levels. For the study on the taxonomic position of P. rungsuriyanum, the present phylogenetic analyses are primarily conducted based on the molecular dataset published by Guo et al. (2015). The results are consistent with the previous molecular studies (Chochai et al. 2012; Gorniak et al. 2014), indicating that the well-supported division of the genus Paphiopedilum into three subgenera Parvisepalum, Brachypetalum and Paphiopedilum. In this study and the previous report by Gorniak et al. (2014), the positions of P. rungsuriyanum and P. canhii are discordant between plastid and nuclear gene trees. On the ITS-based tree (Additional file 4: Figure S1), P. rungsuriyanum is sister to species of the section Paphiopedilum (PP = 0.91), while P. canhii is sister to a clade comprising species of the subgenus Brachypetalum and section Barbata, but without bootstrap support. In the present phylogenetic analyses, P. rungsuriyanum is grouped with P. canhii in the same lineage (PP = 1.00) based on the ACO tree (Additional file 5: Figure S2). On the DEF4-based tree (Additional file 6: Figure S3), P. rungsuriyanum and P. canhii are embedded in the section Paphiopedilum (BP = 84; PP = 0.99). On the RAD51-based tree, P. canhii is embedded in the section Paphiopedilum, while P. rungsuriyanum is sister to the clade comprising species of sections Paphiopedilum, Barbata, Coryopedilum and Pardalopetalum (Additional file 7: Figure S4). Based on the plastid tree (Additional file 8: Figure S5), P. rungsuriyanum is embedded in the clade comprising sections Barbata and Paphiopedilum, while P. canhii is sister to the subgenus Paphiopedilum. According to the analysis from combined data (Fig. 5), both P. rungsuriyanum and P. canhii are sister to the section Paphiopedilum and embedded in the subgenus Paphiopedilum. The incongruence between plastid and nuclear gene trees may be caused by horizontal gene transfer, hybridization, and/or incomplete lineage sorting (Nishimoto et al. 2003; Maddison and Knowles 2006; Kim and Donoghue 2008; Petit and Excoffier 2009; Yu et al. 2013). In Paphiopedilum, based on the multiple low-copy nuclear genes and the network analyses, subgenus Paphiopedilum (particularly sections Barbata, Cochlopetalum and Paphiopedilum) had a higher species diversification rate than the other subgenera of Paphiopedilum, suggesting that hybridization plays an important role in speciation (Guo et al. 2015). Due to the lack of strong interspecific reproductive barriers in Paphiopedilum species, it is proposed that as the geographic and ecological changes (e.g. sea-level fluctuations) disrupted the species boundaries, the interspecific hybridization may lead to the genome introgression across species barriers and contribute to the reticulate evolution in Paphiopedilum (Guo et al. 2015). 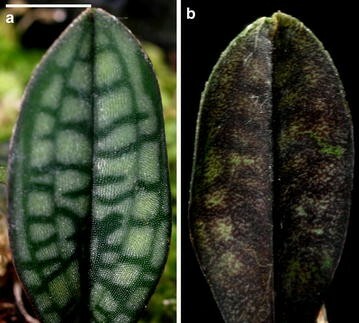 In P. canhii and P. rungsuriyanum, their miniature plants with marbled leaves can be easily allied to the taxonomic position associated with species of the sections Parvisepalum (subgenus Parvisepalum) and Barbata (subgenus Paphiopedilum) as suggested by Averyanov et al. (2010). However, from molecular analyses, it is hard to connect P. rungsuriyanum to any species of subgenus Parvisepalum. Species of subgenus Parvisepalum have markedly different floral morphology from those of P. rungsuriyanum, such as the staminode without any umbo, the mammillated stigmatic surface and the granular pollinia (Additional file 9: Table S4). In Paphiopedilum, the staminode morphology provides taxonomically important information for species delimitation (Braem 1988; Cribb 1998). Morphologically, the staminode of P. rungsuriyanum looks intermediate between those of sections Barbata and Paphiopedilum, being half-moon shaped with three lobes and a slight umbo in the middle (Fig. 1c). The staminode of section Barbata is characterized by semi-lunate shape and more or less tri-lobed or tri-dentate, without any umbo. P. rungsuriyanum and species in section Barbata are alike in the staminode. Besides, as compared with other morphological characteristics, such as marbled leaves, single-flowered inflorescence and petal/sepal ratio, we may possibly suggest a close relation of this species with the section Barbata (Additional file 9: Table S4). Nevertheless, the close affinity to section Barbata (forming a clade with both sections Barbata and Paphiopedilum) is only revealed by the plastid analysis with weak support values (Additional file 8: Figure S5). In the analysis of combined data, P. rungsuriyanum is clustered with section Paphiopedilum species with high support values (Fig. 5). Although the floral morphology of P. rungsuriyanum does not resemble those of section Paphiopedilum species, it is noteworthy that section Paphiopedilum is characterized by staminode with a prominent umbo, and P. rungsuriyanum has a slight umbo in the middle of staminode as well. Guo et al. (2015) indicated that the sympatric distribution and the weak interspecific reproductive isolation may have facilitated the interspecific hybridization and led to higher diversification rate in subgenus Paphiopedilum. In Paphiopedilum, thousands of artificial interspecific hybrids have been made between species from different subgenera/sections and registered in the Royal Horticultural Society (http://apps.rhs.org.uk/horticulturaldatabase/orchidregister/orchidregister.asp), and we can observe various staminode morphologies in these artificial interspecific hybrids. Since Indochina is the hotspot of species in sections Barbata and Paphiopedilum, the intermediate staminode morphology of P. rungsuriyanum might be the results from introgression between sections of subgenus Paphiopedilum in the process of hybrid speciation. Paphiopedilum rungsuriyanum is characterized by the miniature plants with tessellated leaves, a single-flowered inflorescence, a flower having a helmet shaped lip with a V-shaped neckline, and a semi-lunate staminode with an umbo and tri-dents (Figs. 1, 2). These features distinguish P. rungsuriyanum from all of the other known sections/subgenera of Paphiopedilum. The subgenus Paphiopedilum forms a monophyletic group based on the combined analysis, and both P. rungsuriyanum as well as P. canhii are embedded in this clade. Moreover, in P. rungsuriyanum and P. canhii, the comparative studies on karyomorphology and the patterns of rDNA FISH also suggest a closer relationship to subgenus Paphiopedilum. At the present time, based on its specific morphological traits, we propose a new section Laosianum under the subgenus Paphiopedilum to accommodate P. rungsuriyanum, and describe it below. Furthermore, since P. canhii is also embedded in the subgenus Paphiopedilum, we suggest to change the status of subgenus Megastaminodium to section Megastaminodium under the subgenus Paphiopedilum. Section Laosianum Lee, Chung, Sydara, Souliya & Luang Aphay, sect. nov. Type: Paphiopedilum rungsuriyanum O. Gruss, N. Rungruang, Y. Chaisuriyakul et I. Dionisio. The sectional name alludes to Laos, the name of the country where P. rungsuriyanum was found. Although the P. rungsuriyanum and P. canhii have similar tessellated leaves, their flower morphologies are different from each other. The new remarkable section is distinct from other known subgenera/sections in the genus Paphiopedilum by possessing tessellated leaves, the oblong oval petals with intensive red–purple veins, the helmet shaped lip with a V-shaped neckline in the front, and the semi-lunate staminodial shield with trident at the base. This is a monotypic section containing only P. rungsuriyanum. The section is characterized by its single-flowered inflorescence and the miniature plant with tessellated leaves. Although both of P. rungsuriyanum and P. canhii have miniature plants with tessellated leaves, there is a great difference between their flower morphologies. The lip is helmet shaped with incurved lateral lobes and a V-shaped neckline, and the petal is oval shape and intensively red–purple veins. P. rungsuriyanum has a semi-lunate staminode with an umbo and tri-dents that looks an intermediate morphology between those in sections Barbata and Paphiopedilum. The chromosome number of P. rungsuriyanum is 2n = 26. Section Megastaminodium (Braem & O. Gruss) Lee, Chung, Sydara, Souliya & Luang Aphay, stat. nov.—Type: Paphiopedilum canhii Aver. & O. Gruss. LYI and CMC carried out the experimental work; SK SO LAS provided the plant materials; LYI drafted the manuscript; LYI, CMC and SK edited the manuscript. All authors read and approved the final manuscript. We are grateful to Miss Yi-Ching Lee and Yu-Hsiu Cho (NMNS) for helpful technical assistance of FISH experiments, DNA extraction and PCR experiments. 40529_2017_170_MOESM1_ESM.docx Additional file 1: Table S1. Voucher and GenBank accession number of plant materials used in this study. An asterisk (*) denotes the sequences of species that were obtained from GenBank. 40529_2017_170_MOESM2_ESM.docx Additional file 2: Table S2. Primers used in this study. 40529_2017_170_MOESM3_ESM.docx Additional file 3: Table S3. Results of the best fitting models from MrModel test for datasets. 40529_2017_170_MOESM4_ESM.tif Additional file 4: Figure S1. One of the most parsimonious trees from the analysis of ITS for Paphiopedilum. Bootstrap percentages (BP) >70 and Bayesian posterior probabilities (PP) are given for supported clades above the branches. 40529_2017_170_MOESM5_ESM.tif Additional file 5: Figure S2. One of the most parsimonious trees from the analysis of low-copy nuclear gene, ACO for Paphiopedilum. Bootstrap percentages (BP) >70 and Bayesian posterior probabilities (PP) are given for supported clades above the branches. 40529_2017_170_MOESM6_ESM.tif Additional file 6: Figure S3. One of the most parsimonious trees from the analysis of low-copy nuclear gene, DEF4 for Paphiopedilum. Bootstrap percentages (BP) >70 and Bayesian posterior probabilities (PP) are given for supported clades above the branches. 40529_2017_170_MOESM7_ESM.tif Additional file 7: Figure S4. One of the most parsimonious trees from the analysis of low-copy nuclear gene, RAD51 for Paphiopedilum. Bootstrap percentages (BP) >70 and Bayesian posterior probabilities (PP) are given for supported clades above the branches. 40529_2017_170_MOESM8_ESM.tif Additional file 8: Figure S5. One of the most parsimonious trees from the combined analysis of four plastid regions (atpI-atpH, matK, trnS-trnfM and ycf1) for Paphiopedilum. Bootstrap percentages (BP) >70 and Bayesian posterior probabilities (PP) are given for supported clades above the branches. 40529_2017_170_MOESM9_ESM.docx Additional file 9: Table S4. 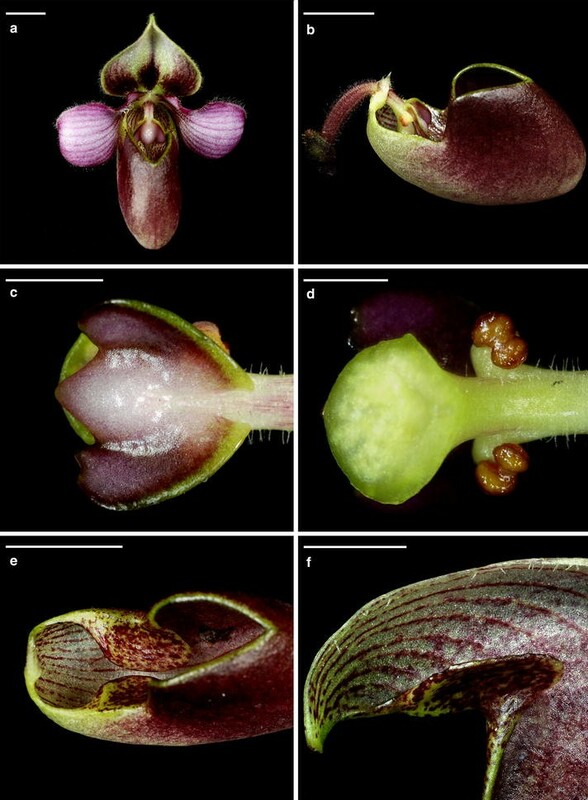 The comparison of main significant traits between subgenera and sections of Paphiopedilum by Gorniak et al. (2014) and the present study.